The new plans from developer Benson Elliott for the part of the ‘Arcadia’ site opposite Ealing Broadway station include a new 5,000 sq ft music venue on the plot of the 1960’s Ealing Club – the birthplace of British Rhythm & Blues. This is great news and congratulations to everyone involved on getting this in to the plans. There is much more to the plans including an 18-storey building, 20 new shops and ‘191 quality homes within residential courtyards above Haven Place, including 30% intermediate affordable housing delivered at discount market rent aimed at existing Ealing residents and young professionals.’ You can find out more on their website. 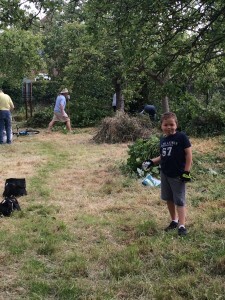 T he WEN Abundance team enlisted the help of neighbours living around Walmer Gardens for the first of our monthly clear up days in the council owned Orchard we look after. We cut down nettles, Ivy, elder and grass over a couple of hours and took a lot of rubbish to the dump too! With a handful of people it is amazing what can be achieved. There’s more to do over the summer months so if you fancy getting a bit of exercise in a beautiful location, whilst doing some good then contact Diane Gill on wenabundance@gmail.com to get involved in these clear ups. ‘The majority of services running out of the current Jubilee Children’s Centre location in Green Man Gardens will cease on the 10th of July and from the 22nd of July all remaining health services will also stop running from that location and will instead run from Mattock Lane until the Children’s Centre is ready to open at its new location in Drayton Green. We have informed the families who use the service of the change of location, consulted and supported them regarding their travel plans to the new location and have sent notifications of the date that the services will cease to run from Jubilee Hall. We have also sent them a list of nearby Children’s Centres where they can access services over the summer. Please see the attachment for this information. It is our intention that the Jubilee Children’s Centre reopens at Drayton Green on the 7th of September 2015 when all services will start up again from there. The council and contractors are all working very hard to get the centre up and running for this date. The relocation of Jubilee Hall on Drayton Green is a temporary measure to ensure as much continuity of the service the centre provides, as possible. This is part of the wider scheme of the regeneration of the Green Man Lane Estate where St. John’s Primary School will be rebuilt and expanded to a three form of entry primary school in order to provide additional school places for the growing community in the area. The primary school will be ready for occupation for September 2017 and the permanent building for the new Jubilee Children’s Centre will be complete in approximately 2020.